The outgoing telephone message of the local merchant association ends this way: "Remember, shop the Hub Third Avenue Business Improvement District, located in the heart of the Downtown Bronx." For years, some Bronx groups have quietly pushed "Downtown Bronx" to replace the charged term South Bronx, which for many Americans evokes an anarchic, high crime, burned-out neighborhood that became infamous in the 1970's. Now that the Los Angeles City Council voted on April 9 to rename its similarly infamous South Central neighborhood as "South Los Angeles," can the Bronx be far behind? No official action can do the trick here. Unlike South Central, the South Bronx is not an official term and does not appear on maps. Even its borders are nebulous and ever-shifting. In the 1950's, it referred to just the southernmost neighborhoods of the Bronx, but over the decades it expanded. Today, many people refer to anything south of Fordham Road as the South Bronx; others place the line much farther south, at the Cross-Bronx Expressway, perhaps, or 149th Street. "Downtown Bronx" has not caught on yet, but the name is popping up. There is the Downtown Bronx Economic Development Corporation and the Downtown Bronx Resurgence Corporation. Adolfo Carrión Jr., the borough president, used the term twice in his recent address on the state of the borough. And the Hub Business Improvement District is ordering street banners that read "Downtown Bronx Shopping District." The executive director of the business district, Vincent Valentino, supports the new term because he has grown frustrated at wisecracks about Fort Apache and "the Bronx is burning" that he has encountered when traveling. For him, those are distant memories of his days as a rookie cop in the 1970's, not today's reality. But many oppose the new name. Some are used to the way things are, or find the new term silly. Then there is Representative José E. Serrano, who loathes it. "You don't run away from your past, and you don't feed into people's stereotypes," he said. "We somehow pulled it together to the point it's at now. To say we're no longer the South Bronx is running away from who we are." He said he has told local organizations that anyone using "Downtown Bronx" can forget about Congressional appropriations. Gary Axelbank, the host of two cable television programs about the Bronx, added: "The name is not really accurate or appropriate. I think the name implies a civic center where you can get everything." An informal street survey in the Hub area found the idea a long way from catching on. "The Downtown Bronx? The Downtown Bronx?" asked a puzzled Ian Johnson, a student at Hunter College. "It's a nice name, a sanitized name," he said, adding that the term might have business value. "But it's the South Bronx. Audy Pasols, 36, agreed. Why? "The name is not catchy," she said. Something more original. Hell's Living Room. Or maybe Hell's SoBro Downtown BX, yo, Kitchen and Bath Partially Historic District. Actually, Downtown BX sounds good. Very good. DTBX, like TXSQ... I'm serious. I've heard the term SoBro before. *I'm pretty sure who ever used it was being sarcastic, but you never know. *It may catch on. Is there an economic heart to the Bronx, with department stores, offices, etc.. or is it a patchwork of neighborhoods without a true center? *I'm suspecting the latter. Not too sure, but maybe the Grand Concourse. BTW, there's actually an economic development group called SoBro. 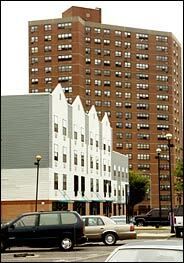 The south South Bronx's commercial center is the Hub, at the intersection of 149th Street, 3rd Avenue and others. It used to be the borough's first but now is only third, behind Fordham Road and one in Co-op City. The Bronx already has named neighborhoods. It's perplexing to me that people would want to change that. Interestingly enough, I once saw a subway map from the 1970s that replaced every neighborhood below Fordham Road with "South Bronx". An apartment complex was recently built on Brook Avenue near 156th Street in front of public housing. It has been said that the human spirit is by nature optimistic and that the slightest changes have the power to elevate its mood. When people are feeling mired, they may change hairstyles or brands of beer, but rarely can a neighborhood comfort itself by changing habits all at once. It can, however, change its name. Take the South Bronx, for example, where a growing group of residents say they have tired of being thought of as the ugly stepchild of the borough. The neighborhood, they say, has outgrown its reputation as a place of drive-by shootings, poverty and apartment buildings racked by flame. In an effort to repair the broken window of its image, they have decided to leave the social work to the social workers and the redevelopment to the developers. They have instead have embarked upon a somewhat quixotic mission to improve the image of the neighborhood by changing its name. "The South Bronx will become the Downtown Bronx, believe you me," said George Rodriguez, who is leading the campaign. Mr. Rodriguez is the chairman of Community Board 1, which serves Melrose, Mott Haven and Port Morris, and he has lived in the South Bronx for more than 40 years. As befits a man who has placed great faith in the healing power of language, Mr. Rodriguez speaks of his particular tilt at the windmills of prejudice in eloquent, if slightly tortured, terms. "We are extraordinarily gung-ho in this matter," he said last week. "It has not been undertaken capriciously or contrary to good thinking, but to change the stigma. If you take a helicopter and go upstairs into the sky and look down, you will see that the neighborhood has changed." He is correct. The South Bronx is no longer the blockswide conflagration that shocked the country during the 1977 World Series when the Goodyear blimp flew above its streets and beamed horrific images of rampant fires and billowing smoke to television viewers across the nation. Nor is it quite the zone of desolation caught by news cameras that year when President Jimmy Carter tiptoed through the gutted rubble of Charlotte Street. Nonetheless, the neighborhood has problems not easily fixed by switching a couple of words on its street signs. The South Bronx is part of the poorest Congressional district in the country. Unemployment is nearly 20 percent. More than half the children in the district live in poverty, according to the South Bronx Overall Economic Development Corporation. Half the population relies on public assistance. A third of the households earn less than $10,000 a year. This onslaught of statistical misery has done little, if anything, to curb the enthusiasm of Mr. Rodriguez and his partners, who say their first order of business is to place new signs on the Bronx side of the Willis Avenue, Madison Avenue and Triborough Bridges saying, "Welcome to the Downtown Bronx." In the three months since the City section of The New York Times reported on the movement to rename the South Bronx, Mr. Rodriguez has reached out to the boards of several local institutions, from Lincoln Hospital to Hostos College, to generate support. His group is also working with members of the City Council to have the neighborhood's name officially changed. "I am more than highly optimistic," Mr. Rodriguez said, "that all of this will occur next year." That said, there is plenty of time to delve into the history of the South Bronx, a term that came into use in the late 1940's, according to Lloyd Ultan, the borough historian. Mr. Ultan said the term was coined by social workers who had noticed pockets of poverty appearing in the neighborhoods around 138th Street as black and Latino families escaped the crowding of Harlem by flooding northward after World War II. By the 1950's, everything south of 149th Street was considered to be the South Bronx. By the 1960's, it was everything south of the Cross-Bronx Expressway. By the 1970's, Mr. Ultan said, the border had crept north to Fordham Road. "I remember saying once that if this keeps going, anything south of McLean Avenue would soon be the South Bronx, and McLean Avenue is in Yonkers," he added. Oddly enough, there was never a section of the Bronx that was thought of as a downtown area, Mr. Ultan said. It is different from Brooklyn, for example, where a clearly defined downtown sits in the neighborhood surrounding Borough Hall. The Bronx had — and still has — transportation and business hubs, but they are far-flung, Mr. Ultan said, from the main government office on 161st Street to the shopping districts of Co-op City and Fordham Road. To consider the South Bronx as the Downtown Bronx does not, however, offend him. "Frankly," he said, "it's just as good as any other place." The South Bronx is hardly the first location in the country that has tried to polish its image with a name change, and it could be instructive to determine whether other towns and cities have benefited by a switch. "I haven't seen it do a thing for our town, and I've been living here since I was 18," said Shirley Wadding, 58, who is the mayor of Lake Station, Ind., which changed its name from East Gary in 1977. "Basically, we didn't want to be associated with Gary anymore, but all it got us was our own identity." The residents of Eastpointe, Mich., could be considered experts in the name-change game. The town, on the eastern border of Detroit, has gone through five names. Founded by Irish Protestants, it was first known as Orange. When Irish Catholics moved in, it became Erin Township. Because it is halfway between Detroit and Mount Clemens, it was later called Halfway. Eventually, it became East Detroit, a name that stuck until 1993, when its residents, perhaps exhausted, settled on Eastpointe. "I wasn't in favor of that last change," said Harvey Curley, who was mayor then. "I guess I'm the nostalgic, traditional sort." Some places have found a tremendous boon in changing their names. In fact, one need look no farther than Sleepy Hollow in Westchester County to find an example of improvement by renaming. Sleepy Hollow, which was known as North Tarrytown as recently as 1996, found inspiration for its new name in "The Legend of Sleepy Hollow" by Washington Irving, who had a large estate there. When the movie "Sleepy Hollow" was released a few years ago, the tourists and investors started coming to town in semi-impressive numbers. "We get all types of people calling and visiting," said Mayor Philip Zegarelli. "It's a mysterious name with a mystique all its own. It has a type of cachet on the ground." Unfortunately, the Downtown Bronx lacks a certain cachet and does not quite roll off the tongue with the same sort of spooky allure. Not that Mr. Rodriguez cares a whit. "I concur somewhat about the name," he said, "but the Downtown Bronx is exactly what it is. You've got the north Bronx, the west Bronx, the east Bronx and the Downtown Bronx. "Just not the South Bronx, you understand?" 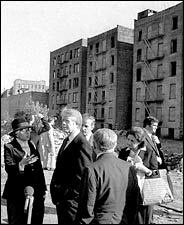 The South Bronx is not quite the zone of desolation caught by news cameras in 1977 when President Jimmy Carter visited. The lack of a downtown is probably due to the fact that it was an original part of the city, with Manhattan as the core. That's right. The West India Company bought the place in 1639. It was part of New Amsterdam. Mayor Michael R. Bloomberg today announced that the Related Companies will develop a $53 million two-story project on a piece of vacant, City-owned property just north of the Bronx HUB. At the Bronxchester Site 12, the 160,000 square feet mixed-use project will house the Department of Finance’s new offices, retail space for one to three retailers, and the renovation of an unsightly parking garage. In addition to the 225 Department of Finance employees who will work at the Bronx Business Center, the developer expects that the retail portion of the project will directly create about 200 jobs in addition to 260 construction jobs that will result from the 18 to 24 month construction period. Bronx Borough President Adolfo Carrión, Jr., Deputy Mayor for Economic Development and Rebuilding Daniel L. Doctoroff, EDC President Andrew M. Alper, Finance Commissioner Martha E. Stark, and The Related Companies Chairman Stephen M. Ross joined the Mayor at the development site, which is located between 153rd and 156th Street on Third Avenue, north of the HUB commercial district. Earlier this morning, Mayor Bloomberg said during his economic development address at the Association for a Better New York breakfast, that the City would do its part to facilitate economic development in every borough. Related was designated to develop the site as a result of a Request for Proposals issued by the New York City Economic Development Corporation (EDC). In addition to the new DOF offices, Related plans to construct 66,000 square feet of retail space in a new two-story building for one to three retailers. Related will also completely renovate the unsightly parking garage on the site that has not been fully utilized for years. An additional store will be located in 15,000 square feet of retail on the ground floor of the 273-space, three-story parking garage. Related, which is making a $42 million investment in the site, expects that the retail portion of the project will directly create about 200 jobs in addition to 260 construction jobs that will result from the 18 to 24 month construction period. The overall project will generate $35 million in sales tax revenue for the City over 25 years. Construction is scheduled to begin in the summer of 2004. The move will enable the Department of Finance to reduce wait times for residents who wish to contest parking tickets, record deeds and pay bills. Finance plans to locate 225 employees in 74,000 square feet of space on the second floor of the office/retail project to be constructed by The Related Companies LP, and estimates that the City will spend $10.4 million for tenant improvements and furniture at its new offices. The Bronx Borough President has committed to providing $500,000 for tenant improvements as well. The HUB, the principal shopping and business district of the South and Central Bronx, is home to national, regional and local retailers. Lincoln Hospital and a major residential development are nearby. The site is easily accessible to subway lines and bus routes, as well as the Major Deegan and Bruckner Expressways. In addition to parking hearings and payment windows, the Bronx Business Center will house Finance’s City Register’s Office, which provides deed recordation services through state-of-the-art technology, the Automated City Register System (ACRIS). Offices for the surveyor, the sheriff and the property division will also be located at the new site. Currently, Finance’s Bronx operations are divided between two locations, at 1400 Williams-bridge Rd. and 1932 Arthur Avenue – neither of which is convenient to mass transit or parking. The new location, with its proximity to the No. 2 and 5 subway lines and ample parking, will make it easier for Bronx residents to conduct business with the City, in vastly improved office space that is far superior to the current spaces. “The $53 million project will also extend the vital commercial activity of the southern part of the HUB to the north and create a bridge between the HUB and the residential area of Melrose where the Department of Housing Preservation and Development has invested heavily in revitalization,” said EDC President Alper. This is just one of many EDC projects underway underscoring the City’s efforts to bring economic development to the boroughs. Near the Bronxchester Site 12 location, EDC has designated Starrett Corporation and Blackacre Capital Management LLC to develop office space, a supermarket, additional retail and housing. The project will occupy 250,000 square feet of land bounded by East 149th Street and Grove Street and Brook and Bergen Avenues, dissected by Westchester Avenue. And earlier this month, the Mayor attended a “topping out” ceremony for the Fulton Fish Market at Hunts Point, a project that when completed in early 2005, will bring about 600 jobs to the Bronx. The City is expecting to select developers for several industrial sites in the Zerega Industrial Park and on Brush Avenue shortly, and to issue a Request for Proposals for the Kingsbridge Armory by the end of the year. In keeping with the Mayor’s commitment to improve waterfront access for all New Yorkers, EDC is sponsoring a project in cooperation with Sustainable South Bronx and The Point, two local community groups, to identify appropriate places for waterfront access and greenway improvements throughout the Hunts Point Peninsula in the Bronx. EDC is also in various stages of negotiations with a number of manufacturers and developers for projects that would bring or expand business in the Bronx, provide additional retail opportunities, as well as new housing units.